A Business Opportunity: World Team Builder Quick Assessment. World Team Builder Quick Assessment. Building a team prior to joining a network marketing company makes perfect sense in principle. I have seen it done in the past and it worked for me then. FREE to join and they give you tools to promote WTB. 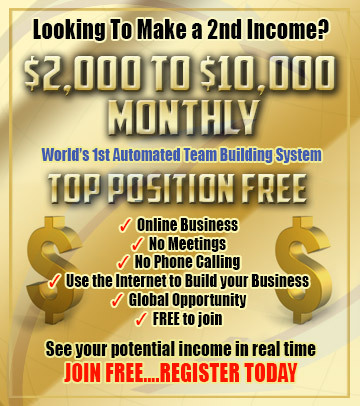 You have access to your downline information and your potential income. Not being told the name of the network marketing opportunity that you are building a team for can be disappointing when it is introduced. Some people may already be a member of their chosen program. They decide what program everyone will join, which gives them a lot of leverage and income potential. Limited information about the people/company behind World Team Builder. I did a search and found very little to verify who they are and what they do. This makes me uneasy because the people behind it could be unsavory. In principle I like the concept behind what these guys are doing; In fact, I had this same concept when I put together 60daystoriches.com. Theirs is much more professional then mine. Helping people build a team before joining a network marketing opportunity works to eliminate early dropout rates. I am leary of not knowing who is behind the website, but it is free. Withholding the name of the opportunity that you are ultimately building a team for is a bit scary, but it works. I have seen it work in the past. When all is said and done, this is a FREE team building opportunity that is well worth taking a look at especially as it has just launched. More information. These guys spent a lot of money to develop this site and once the program was introduced you can see why. It was a very high investment to join their program. One I would not recommend. Update, I walked away from this program once I saw they were just using it for their agenda and promoting very high investment programs. I did learn a lot about great marketing from them thought.